Organisational change is inevitable. Organisations, markets and customers are constantly evolving. However, the big challenge for leading change in the direction that we want is that human beings are wired to resist change. Compared to ‘business as usual’, it takes a lot of mental energy and bandwidth to change our behaviour. And, sometimes this natural human resistance can slow, stop or stifle the management of change throughout an organisation. Whilst the usual change management process steps often address the rational elements of process, workflow and systems in perfectly made plans, the reality of leading change with emotion-filled human beings can be difficult. This is where leadership development programs often fail as they don’t focus on harnessing the right mindset for change, leading to failure. One useful tool for leading change is the change curve. It provides a framework for mapping the emotions people are likely to be experiencing during different stages of the change management process. Considering the change curve can significantly boost the chances of successful organisational change, because it addresses the key thing that makes change happen: people. If you can’t bring your people along with you, then your efforts for managing change will fail. The Kubler Ross Change Curve has been adopted into the world of organisational change from an unlikely source. Elisabeth Kubler Ross was a Swiss psychiatrist who developed it in response to working with terminally ill patients. The original Kubler Ross model dealt with five stages of grief: Denial, Anger, Bargaining, Depression and Acceptance. As a change management process, these five steps have been cut down to four phases: Denial, Anger, Exploration and Acceptance. As a change leader, the Kubler Ross change curve works as a rough map to position your employees on. Plus, it provides you with some simple steps for managing change and helping them move forward. This is important because the management of change is not a fixed recipe with set ingredients. Instead, in leading change you will need to tailor your strategies to phases of the change curve and the subsequent emotional responses that your teams may have. The first stage of the change curve is denial. Given the human tendency to resist change it makes sense that our most common reaction to change is to deny it’s happening, or to just ignore it. An an executive, it’s common to hear people question why you are making the change and whether or not it will succeed at this stage. An effective strategy for combatting denial is to open communication channels as part of your change management process. Avoid one-way telling and engage with your teams in face-to-face conversations. Give them the chance to voice their concerns. And start to explore the reasons why the change is needed and what the consequences might be if it’s not completed. Employing a team of change champions at multiple levels throughout your organisation, rather than simply having top-down conversations, can be a crucial and effective part of your change management strategy. The second part of the change curve is a negative reaction, as teams start to understand the change. During this phase your teams are likely to resist the change or become angry about it. It’s common for people at this stage to say ‘it’s not fair’ or point the finger of blame. At a simple level, anger is a frustration caused by an inability to have choice about a situation or to impact it. A solution for this is to continue informal conversations and work with your team to have them understand and shape the nature of the organisational change that you are working toward. The third phase of the change curve is exploration. 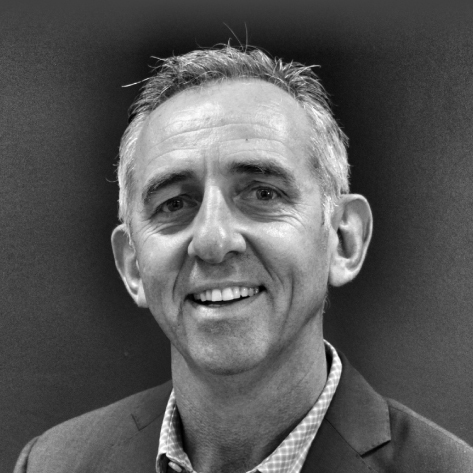 Usually teams begin to adopt new techniques and mindsets, as they realise the change could be permanent. The negative tendency here will be to shortcut the process and look for ways to ‘get through it’ quickly. Your goal during this stage is then to encourage teams to explore the steps of the change implementation so they feel included and are eager to adopt all aspects of the new change. This includes focussing on timelines and tasks that need to be completed. By defining these as manageable, easy-to-follow steps it will be easier for your people to complete a successful transition. The fourth and final stage of managing change using the Kubler Ross framework is acceptance. This is when you see your people starting to commit to the change. This is not the end, merely a milestone that suggests people are now on board. To continue this progression, start to look for ways to provide feedback, acknowledgement, recognition and rewards. This will keep your organisational change heading in the right direction. If all of our efforts in leading change went according to plan, life would be easy. Instead, managing change requires a dynamic and flexible approach that ebbs and flows with the emotions of your employees. Some people will jump on board full of enthusiasm, some will take cautious steps and others may resist the whole process. A good change manager will take this into account. 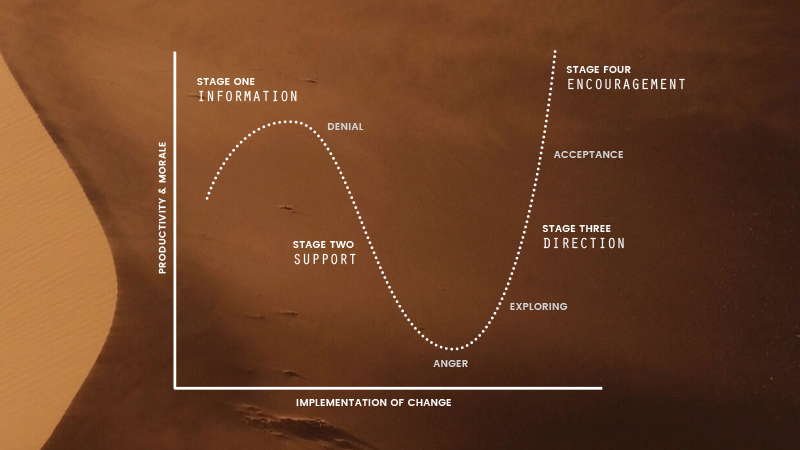 The Kubler Ross change curve introduces the need to manage and influence the emotions of your employees through the organisational change process. For a more detailed analysis of this relationship see our new change management ebook about the impact of emotional resistance on organisational change.